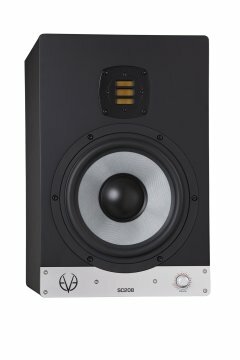 EVE SC208 - 2-Way 8" Active Monitor > Eve-Audio > Diffusion Audio Inc.
With the SC208, you will be able to extend your bass frequency response down to 36 Hz. Our custom-made 8" SilverCone woofer driven by a sophisticated low distortion copper cap magnet systemwith our 1.5" voice coil will guarantee that you will not run out of bass response when it comes to the critical listening and comparison of your mixes.The result is a very tight and dynamic bass, along with the usual greater linear excursion provided in every other EVE Audio model. With every EVE Audio speaker, you also get high resolution DSP electronics.One push knob operation and you will have access to accurate volume control and several different filter settings that will help you tailor your monitors to the way you work. If you always avoid digital processing, we've got you covered. The DSP engine is supported with a high quality A/D converter (24bit/192kHz) from Burr-Brown, which delivers a pristine signal to the DSP section. And since the PWM amplifiers are directly connected to the DSP, no additional conversion is necessary.Please visit our DSP page to learn more about our DSP philosophy. It's all in the geometry.One of the downside effects of port compression is bass distortion. As you turn up the volume, the efficiency of the port reduces and distortion will increase. The results?High sound pressures with tight and punchy bass frequencies that don't cause port distortion.Crank up the volume, and EVE will deliver a round bass.And with no holes to look at every time you glance at your speakers.